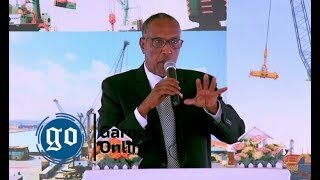 MOGADISHU, Somalia - Al-Shabab and pro-Islamic State militants in Somalia are engaged in an economic war, and it is the country's business sector that is getting cut down in the crossfire. Al-Shabab has already strong-armed business owners for years to finance its war against the Somali government and African peacekeepers who protect it. Now, al-Shabab is stepping up its demands, and pro-IS groups are apparently trying to fund its own activities by copying Shabab's tactics of pay up-or-pay the consequences. The groups are leaving a trail of bodies as a warning to those who don't cooperate. 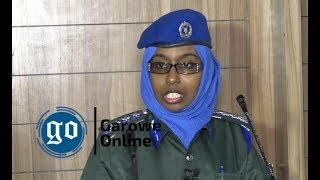 Somali intelligence sources say IS militants killed telecommunications official Abdullahi Ali Omar in Bosaso on August 7 for not paying up, and that they're also behind the more recent shootings of at least eight employees of Hormuud, the country's largest telecommunications company. "Businesses are paying three taxes today, al-Shabab taxes, Daesh [IS] taxes, and the normal government taxes," he said. "The businessman who is paying these three taxes, who started his business with a small amount, is going to be forced to flee to neighboring countries because the business won't pay for itself." "If they don't pay, they will be targeted, as well as their children and wealth," he said. "The punishment is death. They have to choose between the two." Shabelow, a fuel supplier based in Mogadishu, says al-Shabab charges him $2.50 for every barrel of fuel he transports. 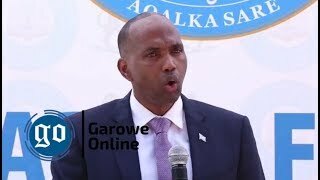 He says the money is usually collected in the city's Bakara market, a remarkable fact is given that the Somali capital is ostensibly in the hands of the government and the African Union force, known as AMISOM. Shabelow says al-Shabab tells traders that if they don't pay the fees, their trucks will be "blown off" the road. That's exactly what happened during a June incident in Somalia's Bakool region when the jihadist group destroyed 11 vehicles and killed six civilians for failing to pay up. Al-Shabab sometimes seeks out more random payments from businesses, schools, hospitals, and individuals, categorizing the payments as infaaq, or support for the group. "Mumin," another businessman, says the demands can be unrealistic. "They might ask someone to pay $100,000 even though his business is not worth that amount," said Mumin. "Eventually, the person either accepts to pay the money asked or faces imprisonment. "Mumin said one businessman who defied al-Shabab was chained to a tree by his arms and legs and left there for hours. 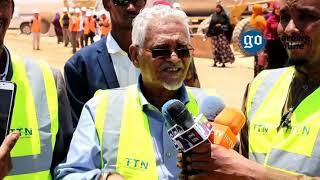 "They say, 'You are a wealthy man, there is work going on, you have to contribute,'" Mumin said. "No businessman or business owner escape from this, no one." How much does the group collect using these tactics? No one knows for sure, but Sheikh-Ali (formerly known as Hussein Moallim Mohamud) says the amount has been increasing annually. "We estimated that in 2017, the best year they have had, they collected $27 million," he said. Until recently, IS was active only in Somalia's semi-autonomous Puntland region. But the recent wave of attacks suggests they are expanding their reach. Somali intelligence sources say IS set off a bomb outside Mogadishu's Salama bank on September 14 after the bank defied the group's extortion demand. 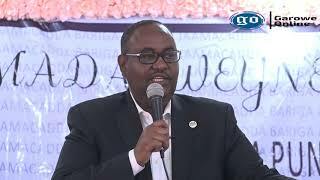 Three days later, gunmen in Mogadishu attacked a senior bank official, Abdulkadir Haji Wasa, firing bullets into his head. Wasa survived and is now being treated in Turkey, where he is said to be in critical condition. 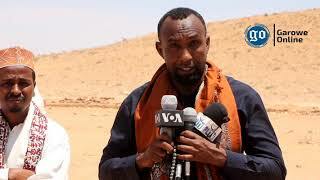 Security officials say they believe after three years in the remote mountainous region of Puntland, the IS militants found that if they want to survive they have to return to the cities and raise funds. Targeting the businesses is a part of the drive to impose themselves in urban areas, they say.